Flash Floods don’t stop team Nut up or Shut up! Van One Team Nut up or Shut up: Back row left to right: Jillybean, Shoeless Joe, Matt, and Kilo. Kneeling left to right: Mel and JJ. Van Two Team Nut up or Shut Up back row left to right: J$, Spongebunny, and Swiss Miss. Front laying down: me AKA the Captain. Flash flooding in Southern Utah led to the closing of I-15 between Mesquite, Utah, and Las Vegas, Nevada. All of the traffic was diverted onto the Red Rock Relay racecourse. The Utah Department of Transportation informed the race director Wednesday that runners could not be on the road because it was now being used as the primary thoroughfare for the semi-trucks and all other traffic going to Las Vegas by way of Cedar City, Utah. Teams got an email on Wednesday evening explaining that the race would not be cancelled, but that it would be significantly changed. The new plan was to start both van one and van two for all teams at the same time from the starting line and have both vans run the first twelve legs. Essentially the twelve person teams were split into two six person teams, and everyone would start together and run the same 12 legs. 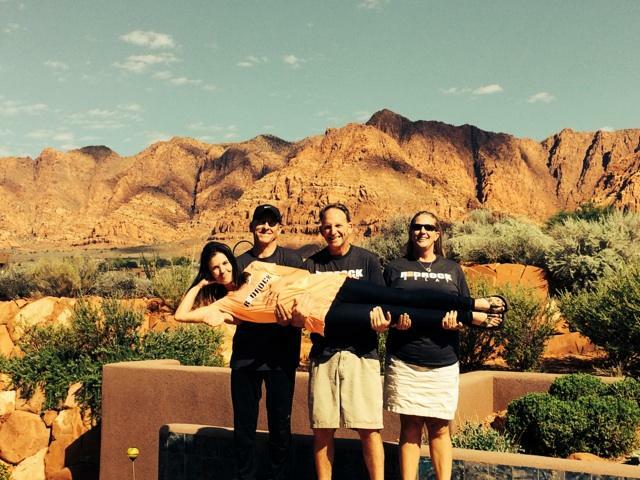 We were all very relieved that the race was not being cancelled because we love Red Rock Relay. But we had a minor problem. There was no way our team’s van two was going to be able to be at Brian Head Resort (starting line) at 7:00 a.m. on Friday morning. It just wasn’t going to happen. Three of us are single parents who had to get children off to school before leaving for the race. School doesn’t start until 8:00 or 8:30 a.m. for the kids. I sent an email to the race director explaining that our van two could not be at the start at 7:00 am on Friday, but we could be there by 11:00 a.m. I explained that I knew this would mean we would be dead last, the finish line would be taken down when we rolled in, and there would not be any race crew members on the course. None of that mattered to us, because we love Red Rock Relay and spending time with one another. The race director was very nice and allowed us to start at 11:00 a.m. She said the course markings and port-a-potties would still be up, and that they would wait for us at the finish line. We were thrilled! I reworked which of my runners would be running which legs of the race for both of my vans and sent out an email to my team. At 6:00 p.m. the night before the race, I received a text from Gadget Gnome. His basement had a half inch of water in it, and he was not sure where the water was coming from. He could not run because he needed to figure it out and clean it up. Van two was down to four members. Not a problem, twelve legs four runners, three legs each. It would be just like any other relay only condensed into 10 hours instead of 36. I sat down and reworked, which of my Van two runners would be running which legs and went to bed. Friday morning J$ picked me up and we drove to pick up Swiss Miss and Spongebunny. I explained what happened with Gadget Gnome and the new leg assignments. Everyone was fine with the new assignments. I was pleased with their ability to just roll with all the changes that happened over the last two days. No one complained. Since my knee is still not 100% and was feeling weird when running downhill, I assigned myself a lot of uphill runs, but that also left me far short of my mile quota for the weekend. Swiss Miss and Spongebunny were kind enough to let me run their uphill legs along side them, so I could get the thirty miles I needed. We had such a great time even though we were only able to run one third of the racecourse. We did get to run the most beautiful section of the course, but it is also the most difficult section of the course. 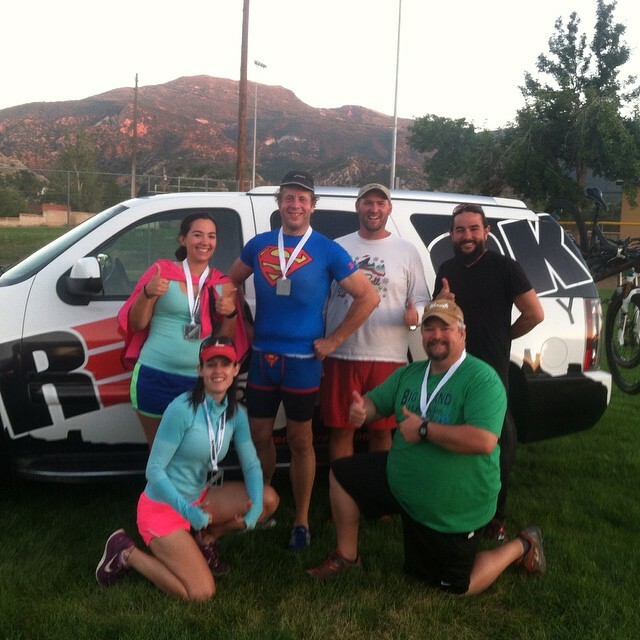 Our van one was able to start at 7:00 a.m., and they were amazing and completed the same course. I am so grateful for my running team. We may not be the fastest team out there, but we know how to have a great time, roll with the punches, and support one another. Me coming in from El Diablo and handing off to J$. 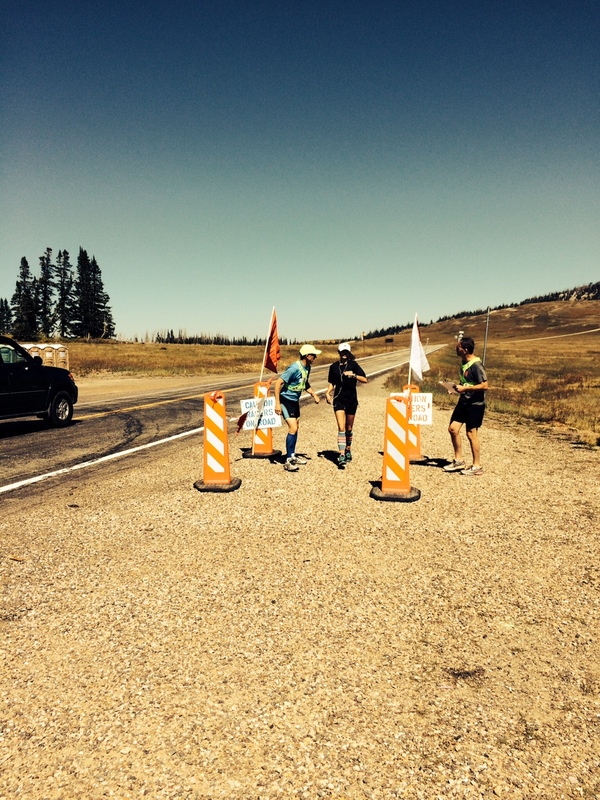 Spongebunny welcoming me back (far right) with a bottle of cold water. Next Article Run 100 Miles? You’ve got to be kidding.